When we ask a question such as this, we must be careful that we are not calling God into question. To wonder why God couldn’t find “another way” to do something is to imply that the way He has chosen is not the best course of action and that some other method would be better. Usually what we perceive as a “better” method is one that seems right to us. Before we can come to grips with anything God does, we have to first acknowledge that His ways are not our ways, His thoughts are not our thoughts—they are higher than ours (Isaiah 55:8). In addition, Deuteronomy 32:4 reminds us that “He is the Rock, his works are perfect, and all his ways are just. A faithful God who does no wrong, upright and just is he.” Therefore, the plan of salvation He has designed is perfect, just, and upright, and no one could have come up with anything better. The punishment for sin is death. God created earth and man perfect. But when Adam and Eve disobeyed God’s commands, He had to punish them. A judge who pardons law-breakers isn’t a righteous judge. Likewise, overlooking sin would make the holy God unjust. Death is God’s just consequence for sin. “For the wages of sin is death” (Romans 6:23). Even good works cannot make up for wrongs against the holy God. Compared to His goodness, “All our righteousnesses are as filthy rags” (Isaiah 64:6b). Ever since Adam’s sin, every human has been guilty of disobeying God’s righteous laws. “For all have sinned and fall short of the glory of God” (Romans 3:23). Sin is not just big things like murder or blasphemy, but also includes love of money, hatred of enemies, and deceit of tongue and pride. Because of sin, everyone has deserved death – eternal separation from God in hell. The promise required an innocent death. Although God banished Adam and Eve from the garden, He didn’t leave them without hope of heaven. He promised He would send a sinless Sacrifice to take the punishment they deserved (Genesis 3:15). Until then, men would sacrifice innocent lambs, showing their repentance from sin and faith in the future Sacrifice from God who would bear their penalty. God reaffirmed His promise of the Sacrifice with men such as Abraham and Moses. Herein lies the beauty of God’s perfect plan: God Himself provided the only sacrifice (Jesus) who could atone for the sins of His people. God’s perfect Son fulfilled God’s perfect requirement of God’s perfect law. It is perfectly brilliant in its simplicity. “God made Him (Christ), who knew no sin, to be sin for us that we might become the righteousness of God in Him” (2 Corinthians 5:21). The prophets foretold Jesus’ death. “Who has believed what they heard from us? And to whom has the arm of the LORD been revealed? For he grew up before him like a young plant, and like a root out of dry ground; he had no form or majesty that we should look at him, and no beauty that we should desire him. He was despised and rejected by men; a man of sorrows, and acquainted with grief; and as one from whom men hide their faces he was despised, and we esteemed him not. Surely he has borne our griefs and carried our sorrows; yet we esteemed him stricken, smitten by God, and afflicted. But he was wounded for our transgressions; he was crushed for our iniquities; upon him was the chastisement that brought us peace, and with his stripes we are healed. All we like sheep have gone astray; we have turned every one to his own way; and the LORD has laid on him the iniquity of us all. He was oppressed, and he was afflicted, yet he opened not his mouth; like a lamb that is led to the slaughter, and like a sheep that before its shearers is silent, so he opened not his mouth. By oppression and judgment he was taken away; and as for his generation, who considered that he was cut off out of the land of the living, stricken for the transgression of my people? And they made his grave with the wicked and with a rich man in his death, although he had done no violence, and there was no deceit in his mouth. Yet it was the will of the LORD to crush him; he has put him to grief; when his soul makes an offering for sin, he shall see his offspring; he shall prolong his days; the will of the LORD shall prosper in his hand. Out of the anguish of his soul he shall see and be satisfied; by his knowledge shall the righteous one, my servant, make many to be accounted righteous, and he shall bear their iniquities. Therefore I will divide him a portion with the many, and he shall divide the spoil with the strong, because he poured out his soul to death and was numbered with the transgressors; yet he bore the sin of many, and makes intercession for the transgressors” (Isaiah 53:1-12). He likened the coming Sacrifice to a lamb, slaughtered for the sins of others. Hundreds of years later, Isaiah’s prophecy was fulfilled in the perfect Lord Jesus, born of the virgin Mary. When the prophet John the Baptist saw Him, he cried, "Behold, the Lamb of God, who takes away the sin of the world!” (John 1:29). Crowds thronged Him for healing and teaching, but the religious leaders scorned Him. 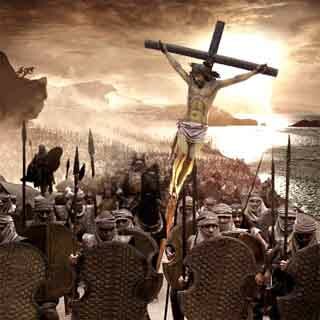 Mobs cried out, “Crucify Him!” Soldiers beat, mocked, and crucified Him. As Isaiah foretold, Jesus was crucified in between two criminals but was buried in a rich man’s tomb. But He didn’t remain in the grave. Because God accepted His Lamb’s sacrifice, He fulfilled another prophecy by raising Jesus from the dead (Psalm 16:10; Isaiah 26:19). Why did Jesus have to die? Remember, the holy God cannot let sin go unpunished. To bear our own sins would be to suffer God’s judgment in the flames of hell. Praise God, He kept His promise to send and sacrifice the perfect Lamb to bear the sins of those who trust in Him. Jesus had to die because He is the only one who can pay the penalty for our sins.